Atlas Emergency Ultrasound, 2E is the app version of Pocket Atlas of Emergency Ultrasound, Second Edition by McGraw-Hill Education. It is now available on all iOS devices, and there’s a version for Android devices. Atlas Emergency Ultrasound contains over 400 ultrasound images and a predictive search option. Users can bookmark sections and create and save notes associated with specific chapters. No internet connection is required to view the content once the user has downloaded the complete app. The design of the app lends itself to be used at the bedside in emergent situations. Each imaging chapter has the following subsections: clinical considerations and indications, technique and normal findings, anatomic considerations, common and emergency abnormalities, tips to improve imaging, and pitfalls. All body systems that are typically evaluated using ultrasound are included. Additionally, the text provides how-to suggestions on skills such as patient positioning and probe placement. A video demo of the application can be viewed here. 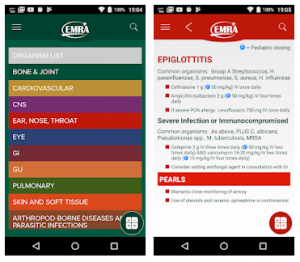 The Emergency Medicine Residents’ Association (EMRA) created this app for colleagues prescribing antibiotics at the bedside. The content is based on the latest guidelines and can be searched by organ system, diagnosis, or pathogenic organism. The developers believe utilizing this app will protect against overprescribing, alleviate pediatric dosage questioning, and provide up-to-date recommendations and approvals from the FDA. It includes a dosage calculator and predictive search option. It also contains recommendations for pregnant and pediatric populations, the costs of antibiotics, and information on newly-approved drugs. The EMRA is the oldest and largest independent resident organization in the world. 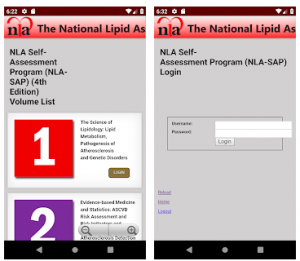 Experts from the National Lipid Association (NLA) have developed a self-assessment program (SAP) that offers over 100 CME/CE hours. The self-paced courses are designed for current practitioners as a guide toward additional training courses, as well as for providers preparing to earn certification in lipidology. Each module is at least 18 CME/CE hours. There are currently five modules available: the basic science of lipidology, cardiovascular disease risk, therapeutic lifestyle changes, pharmacologic therapies, and consultative issues. After each question, users are provided with a rationale that includes specific text references.